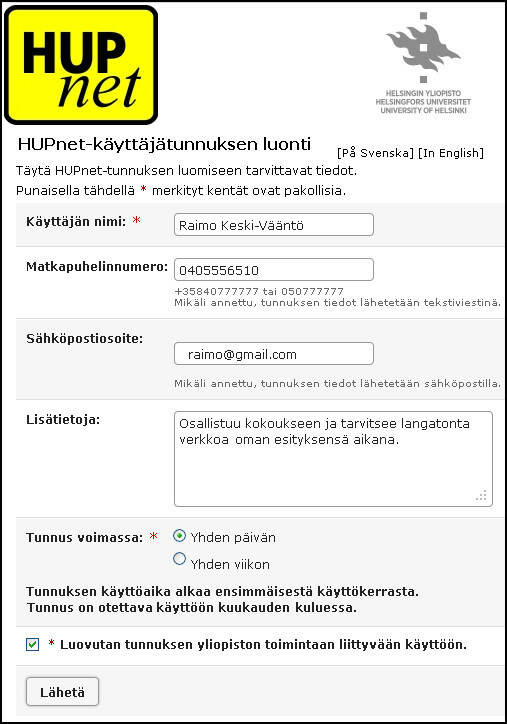 The HUPnet account only allows the user to connect to the University of Helsinki visitor networkwith their own computer or mobile device. The account can be created by a University of Helsinki staff member who has valid personal access rights and a valid employment relationship with the university. HUPnet accounts can be used immediately after they have been created. You can only create an account from a computer in the internal network, with an eduroam connection or at home with a VPN connection. HUPnet accounts will always be in the form hupnet123, i.e. hupnet + a series of numbers. The account can be created by a University of Helsinki staff member who has valid personal access rights and a valid employment relationship with the university. 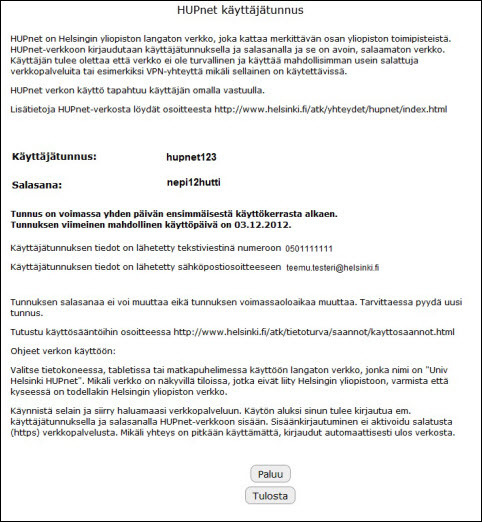 This means that HUPnet accounts can be issued by any University of Helsinki staff member who requires quick university visitor network access for their guests. HUPnet accounts can be used immediately after they have been created. HUPnet accounts can be valid for one day or one week. The accounts can be created beforehand because they are only activated upon first use. Unactivated HUPnet accounts need to be activated within a month of their creation. The account is valid until the midnight of their last day of validity. The account holder’s name and mobile number or e-mail address (or both) should be recorded in the account information. The reason for creating the account (e.g. “ABC conference”, “visiting researcher”, “consultant from Consult Ltd”) can be recorded in the account’s additional information field, if necessary. The account details will be sent to the account holder as a text message to their phone or as an e-mail to the provided address (or as both). If the account holder cannot provide a phone number or an e-mail address (or access to those), the account creator can print out the information from their computer or write the information down on paper. Passwords for HUPnet accounts cannot be changed. If the password is lost or forgotten, a new HUPnet account must be created. Even Helpdesk or IT Center information desk employees cannot view or change the password. Unlike other accounts, a single HUPnet account can also be granted to a large number of people. In the case of a conference, for example, a staff member can create a single HUPnet account for the conference and give the username and password to all of the conference guests. In cases such as these, it is especially important to carefully record the details of the event in the account’s additional information field. Fill in the required information (the user’s name and the account’s validity period). You can record the name in the form First Name Last Name or Last Name First Name. You can record the phone number in the form 070-123456 or 070123456. If the number is foreign, please record it in its longer form with the country calling code included: +35870123456. When the information has been successfully submitted, the account creator will see the following page, which should be printed out to aid memory.